Turtle Bay Lodge is set on 2 acres of waterfront property on the island of Espiritu Santo. Turtle Bay offers guests an array of water activities including snorkelling, diving, swimming and canoeing. The south side of the bay is where the water is calm offering guests a safe haven for many of these activities. The lodge also offers a range of circus activities for both children and adults to try their hand at. Turtle Bay Lodge is close to blue holes, a spectacular sight. 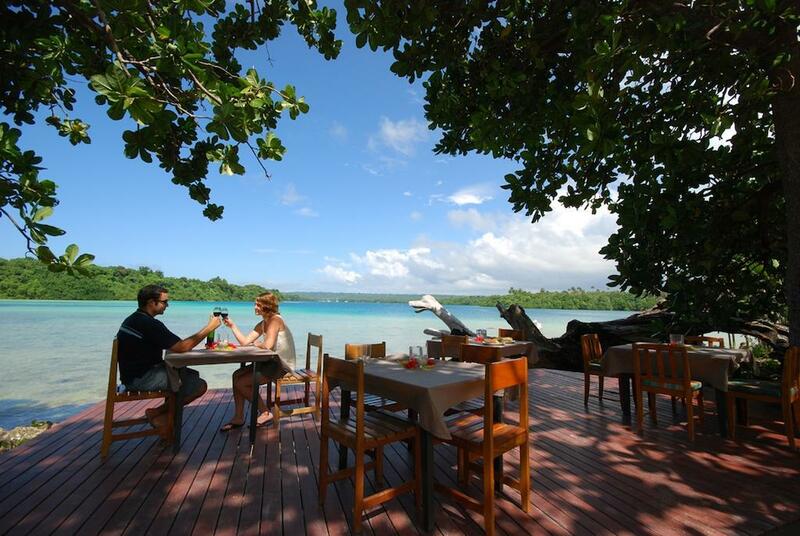 This Vanuatu accommodation features a range of room styles to choose from all with ocean views. Turtle Bay Lodge is ideal for a wide range of travellers to the Santo area including those who are after a relaxing break or adventurous holiday, catering for both couples and families. The rooms at Turtle Bay Lodge are spacious and comfortable. They have been designed using an island theme. Pool Side Budget Double: Features a private verandah. Bedding is 1 Double Bed or 2 Single Beds. Ocean View Double: Bedding is 1 Queen Bed + 1 Single Bed. Pool View Budget Family Room: Features a fridge and overlooks the pool. Bedding is 1 Queen Bed + 1 Set Bunk Bed Set. Sea Front Family Room: Features a fridge, tea & coffee making facilities and ensuite. This room type has two rooms and is located 20m from the ocean. Bedding is 1 Queen Bed + 1 Bunk Bed Set. Turtle Bay Lodge Restaurant & Bar: As the dining options of the main town are not as easily access from Turtle Bay Lodge, the onsite restaurant offers an extensive menu, giving guests plenty of inexpensive dining options. 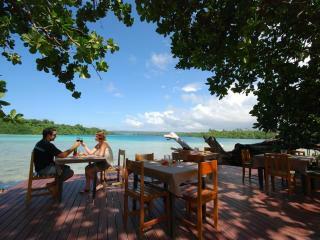 The restaurant uses organic, locally grown fruit and vegetables and purchase most of the seafood from local fishermen.